"Wait, what! Who would wear that at their wedding?" Yep, that was the first thought we had when we heard a bride had experimented with a rather unique shade of blue at her wedding. And we are sure we weren't the only ones to think like that. 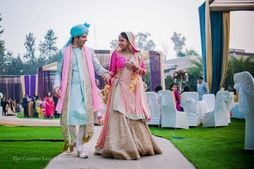 In a world where bride's are mildly (may be not so mildly) obsessed with red and pink bridal lehengas, we spotted real bride Zinal of Payal & Zinal★ 5 , wearing a Pigeon-colored lehenga for her big day. Pigeon, is that even a color? Well, guess it is, and it's rather trending! Don't believe us, have a look here! If you follow WedMeGood rather loyally (you go girl! ), you would know that we have a very special place in our hearts for brides who dare to experiment. 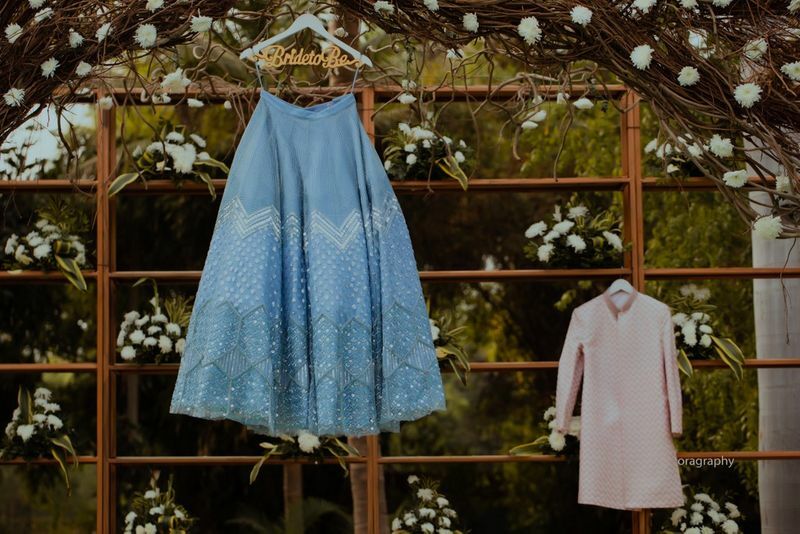 Whether it is with their outfits, decor, or even their mehendi- we are huge fans of brides who are truly indulged in their wedding planning. 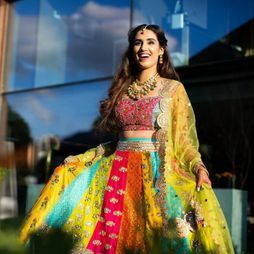 So we got in touch with Zinal and we found to know more about her rather-unique wedding outfit and guess what we found! 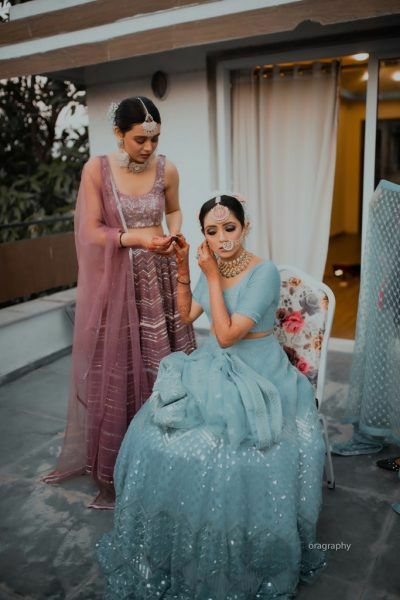 That she designed her Pigeon-colored lehenga herself! Now that really is something! Over to Zinal because who else would know all the necessary details- the what, how, and the when, better than her! "There's this thing about us girls; ever since we are kids, we dream of an ideal wedding- how the halls would be decked with fine, flowy drapes and silhouettes, with flowers decorating the hallways. And then there'll be us, all decked up as brides. It wasn't any different for me. Just with a minor addition. 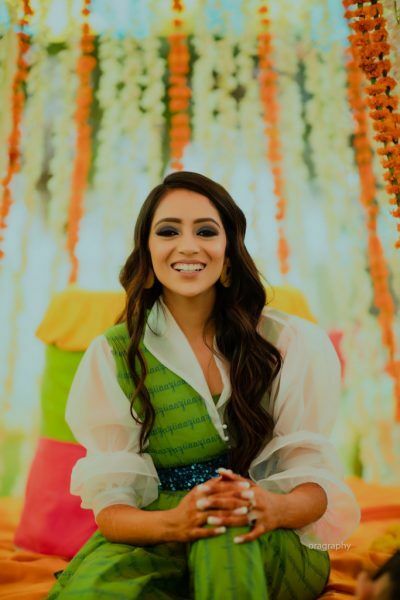 I wanted to be the prettiest bride, and I wanted to wear something of my own, something that I designed myself," shares Zinal. "You may think heading a design label, this would have been a cakewalk for us. But it really wasn't. In fact, this was the first time we were designing a bride's outfit. So if there was one thing that we were sure of, it was that we wanted to break stereotypes and do something unconventional! Have you ever thought of doing something hatke? Well, high-5! 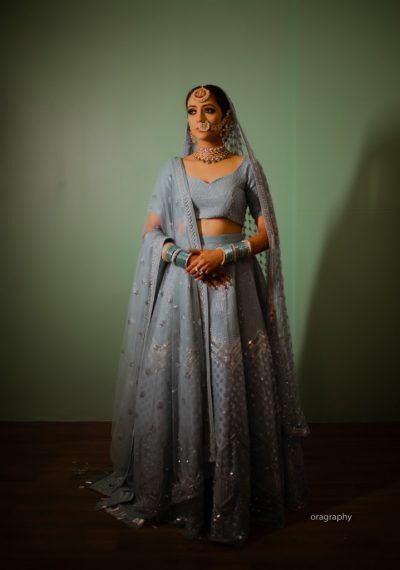 I wanted a powder blue lehenga - it's different, it's fresh, and yet such a classic color! So we set out to N number of shops, trying out silhouettes and colors but we never got our hands on the exact shade that I had been looking for! Call it fate, but Pigeon was the only color closest to the one we were looking for. I was open to experimenting, and I absolutely loved the silhouette- it was classic and timeless, so we thought - "Why not?" We started our shopping haul around April- took us almost a month of running to and fro every bazaar in the city to find all that we needed and finally, started work on the lehenga in May. Guess how long it took us to complete my outfit? 3 months! 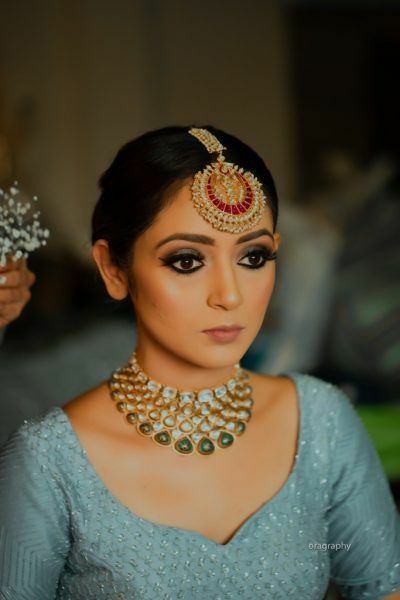 Since my wedding outfit color was so offbeat, it was a real task deciding upon the perfect jewellery to go with it. This might not come as a surprise to a lot of you, because I'm sure you'll relate. 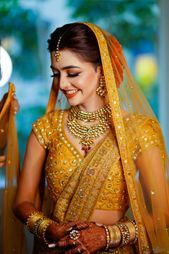 Do your parents also emphasize that a bride must wear real gold jewelry on the wedding day? Well, so did mine! Luckily, I found a stunning choker from Narayan Jewellers in Baroda that complimented my outfit perfectly! I wanted to wear a large mangtikka, instead of a mathapatti with a pop of red. I completed my look with an over-sized, studded nath! And hey, did I tell you- we designed not just my own, but our family members' outfits too. Ask me how that went? Oh, it was really hectic and tiring. Being a bride, I had so many other things to do and keep a check on- but I had fun throughout the process! We had a lovely pastel theme for the wedding, and chose to go for dark colors for our sangeet. For the mehendi, we chose to go with yellows-and greens. I got part of our wedding hashtag- 'Aazi' printed on my mehendi saree, too! Well, that was my story, but it would be incomplete if I didn't give a huge shout-out to my photographer. I personally know Yogi from Oragraphy- I love his work and I would recommend him to lot of couples. You can blindly trust his vision and he also has a wonderful team that would make you comfortable throughout your functions!" 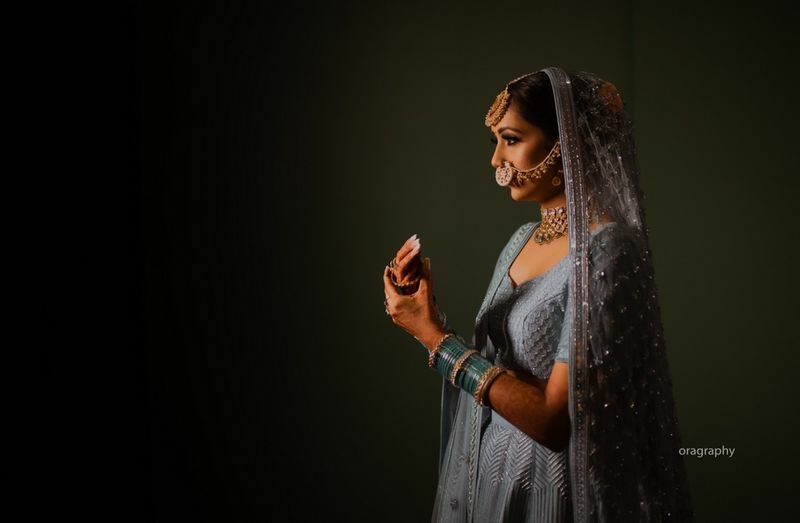 Real Brides Reveal: How I Mixed and Matched My Wedding Lehenga! 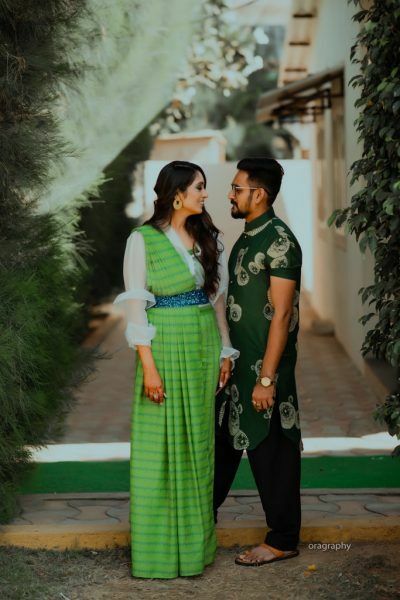 This Bride DIY-ed Her Bridal Lehenga With The Help Of 3 BIG Designers! 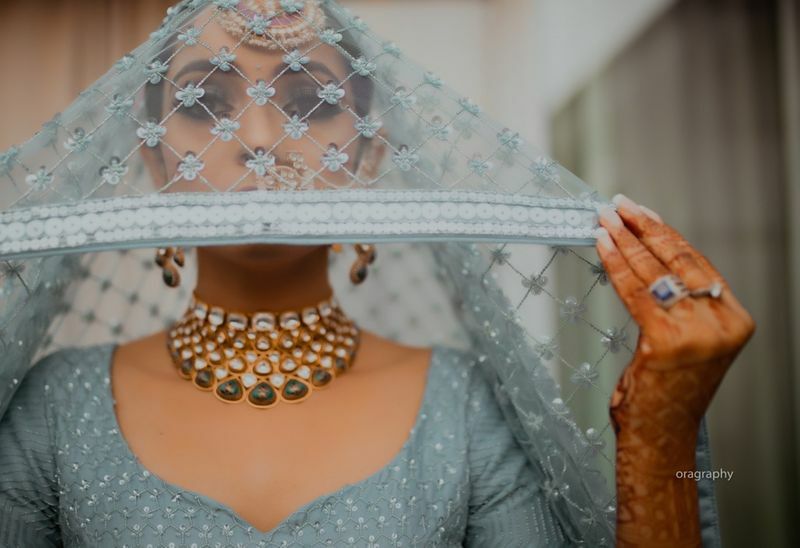 This Bride's NRI In-Laws Got A Beautiful Lehenga Customised For Her & We Are Floored! 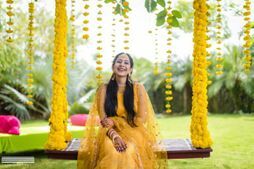 A Minimalist Mumbai Wedding With A Bride In A Self-Designed Breathtaking Gold Lehenga!